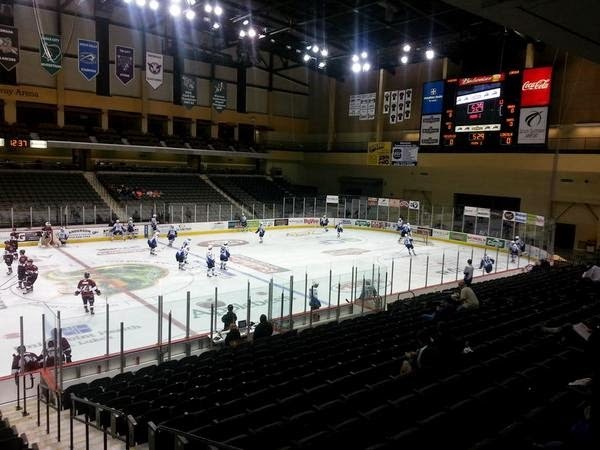 The Lincoln Stars wrapped up their exhibition schedule Saturday afternoon at the USHL Fall Classic in Sioux City, IA with a 7-2 loss to the Muskegon Lumberjacks. The Stars finished the 2014 preseason with a 3-5-0 record in eight games. I'm not sure how much time I want to devote towards this recap. It wasn't a fun game to watch. It was an ugly, penalty-marred contest that couldn't end soon enough. Having said that, I don't think the final score indicates how the Stars played in this particular game. Muskegon certainly was the better team, and deserved to win. They were more disciplined, more physical, and took full advantage of the offensive chances they had. However, the Stars played much better than you would think if you just glanced at the final score. Muskegon pretty much won this game in the first two periods with six goals scored. The bulk of the Lumberjacks scoring (5 goals) came in a six minute span from the end of the first period to the beginning of the second period. In that six minute span, the game went from a 0-0 tie to a 5-0 Muskegon lead that they would ride out for the win. Lincoln goals were scored by Michael Gillespie (SH - primary assist to Wyatt Kalynuk), and Dominick Sacco (PP - nice primary assist to Michael Gillespie). After an uneventful first period in terms of penalty minutes, these two teams combined for 72 PIM's in the last forty minutes. Stars head coach Chris Hartsburg was on more than one occasion visibly upset with referee Lucas Martin. There were a few calls that should have been whistled against Muskegon, especially in the first period. But like I've always said, good teams overcome bad calls. In the end, the 'Jacks got the 7-2 win, and their second victory over the Stars in the preseason. Muskegon outscored Lincoln 11-4 in those two games. I thought the Lumberjacks were one of the better teams I saw at the Fall Classic. They are big, fast, physical, and deep. I believe they will definitely be a playoff team in the USHL eastern conference. Shots were 36-34 in favor of Lincoln. Stars goaltender Peyton Jones stopped 27 of 34 in the loss. Muskegon went 2-for-8 on the powerplay while the Stars went 1-for-5. Lincoln finished the preseason with 3 PP goals in 31 opportunities. Lincoln's penalty kill unit surrendered 9 PP goals in 41 opportunities. What's next? Lincoln and every other USHL team now has the tough task of cutting their main rosters down to a total of 23 players. The deadline to make these cuts is Tuesday, September 23rd. Looking at the Stars' roster, I think they'll only have to make one cut. I assume (D) Dylan Woolf is on the IR, so he wouldn't count towards the 23. (G) Hunter Shepard is no longer on the team, so he wouldn't count as well. So based on the players who have participated in the preseason for Lincoln, I see a total of 24. The Stars will open up the 2014-15 regular season this Friday night at the IceBox where they will face the Tri-City Storm. There's nothing better than a home opener at the IceBox. Really looking forward to that. I'll post a home opener preview article later on in the week.